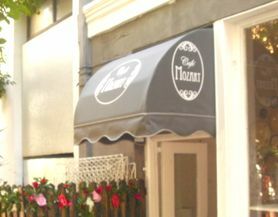 Café Mozart at 37 Church Street, Cape Town, has a new lease on life. Richard Griffin, grandmaster of theatricality, has incorporated it into his family of restaurants. He has revamped, refurnished, redecorated, re - everything and now the place hums with his magic. 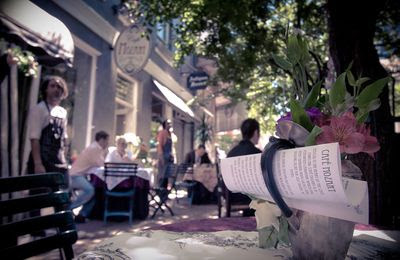 Café Mozart has held court for over 30 years in a beautiful part of Church street. Sunlight filtering through the trees casts a dappled pattern onto cobblestones below whilst stall-owners of the antiques street market compete for custom. 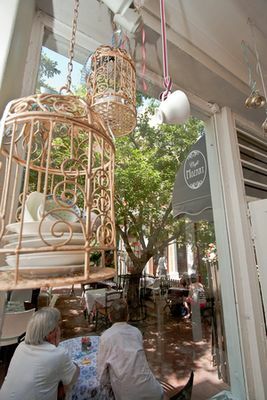 The Café is housed in a lovely old heritage building which has been part of the business scene for many years. In 1939, a locksmith traded there. Imagine what Cape Town CBD must have been like then! Approaching Café Mozart along a pedestrian stretch of Church Street, the first glimpse of the grande dame is quite enchanting. A picket fence entwined with flowers and greenery surrounds an outside area where people are happily eating and drinking. All sorts of cups and fancies hang from branches of the trees, and a suspended wire goat peers at all of this through huge spectacles. Of course it is eccentric and quirky, what did you expect? Richard Griffin has marked his territory. We wandered inside and found ourselves in a large room dominated by a beautiful wooden staircase. Sprightly young waiters and waitresses leap up and down the stairs like mountain goats, their arms laden with delicious looking plates of food. There is a long open galley kitchen on the ground floor and some tables and chairs for those who do not wish to climb stairs or sit outside. The walls are bedecked with all sort of curiosities. Attached wooden pedestals hold all manner of cups, ornaments and flowers. 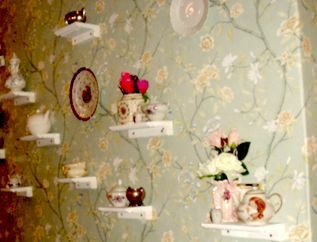 Birdcages filled with cups and saucers are suspended from the ceiling and a collection of plates adorn another wall. In a deep inset window sill, great glass bells cover homemade cakes and pastries. We clambered upstairs clinging to the banister which is also entwined with flowers and greenery. At the top of the stairs, we found ourselves in a fascinating place. A lovely big room, stuffed with antiques and every kind of objet d'art imaginable. Heavy brocade curtains with an art-deco style pelmet and striped wall paper provide a backdrop for the scene that presents itself.. The props for this production include an old studded leather sofa and easy chairs, tables groaning with books, bibelots, boxes and blue and white jars and at one end of the room, an elegant 12-seater table complete with candelabra. Lots and lots of pictures and mirrors crowd the walls. Gracious old writing bureaux with sliding tops are nestled in odd corners of the room. Atop one of these, an old black typewriter. Have we forgotten they ever existed? All that is missing, in my opinion, is a large aspidistra. Mingled in between and around all this are tables covered with long brocade cloths where one can sit and enjoy one's meal. You may also choose to sit in the living room area on the sofa or you may enjoy dining at the long table in the dining-room area. We chose a table by a window. Beyond the window box filled with colourful blooms, we had a view of all the goings-on below. At this point, I felt that we could be sitting in Paris on the Left Bank in a quaint old Café de Thé, overlooking a narrow cobbled street. The menu follows the successful formula developed at the Sidewalk Café. (See Back Chat's article on the Sidewalk Café - another of Richard Griffin's creations.) Breakfast is served from 7am till 12 noon. There are eggs in many incarnations to satisfy a morning hunger; a homemade wheat free muesli, a pancake stack with all the trimmings or traditional Cumberland Bangers. Discover what the Full Mozart is all about or spoil yourself with Eggs Royal with smoked salmon, fresh croissant, spinach and hollandaise. Oh yum!! The lunch menu, which incidentally is included with the breakfast menu on a folded sheet of white paper, promises all sorts of treats. Eugene ordered the soup of the day which was fresh tomato and carrot. I ordered the Mussel Pot with white wine, garlic, cream and fresh herbs. Eugene added a toasted tuna, onion and mayo sandwich, served with salad from their quaintly named 'Toasted Governments' section. We were told that this signified that the sandwiches were made only from 'government brown or white bread'. Whatever! There is also a 'Gourmet Sandwich' section and these are a sight to behold. A meal in themselves. The main menu includes salads and various chicken dishes. I particularly look forward to trying the Chicken and Field Mushroom pie. You can choose from several pasta dishes, 'fab fish and chips', sirloin or bobotie and much much more. We were spoiled for choice. Our food arrived. Lots of lovely plump mussels in their broth served in a big white bowl. Eugene's steaming hot soup arrived in a soup bowl with a lid, accompanied by 'government bread' and butter. I had a great feast of delicious mussels and drank the broth with relish. Eugene loved his soup and then tucked into the sandwich. Naturally, I tasted both his soup and the sandwich. All delicious. Eugene is used to me eating half his food. We ended the meal with excellent coffee for Eugene and Rooibos tea for me. The menu includes a small and well-chosen wine list. You can accompany a lighter repast with a glass of wine of your choice. There is a chef's salad buffet downstairs which changes daily and includes a take-away option. Café Mozart is ideally suited to cater to office-workers who may require takeaways. On the back of the menu is a list of further 'Take Away' options; sandwiches, soup and salads and other tasty morsels. I was charmed to read that Market and Antique traders get a 15% discount. 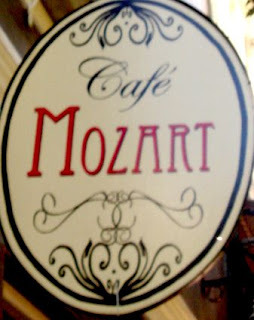 The Café Mozart experience is special. You can enjoy a super breakfast, a quick snack or a leisurely lunch, all day if you wish. You may want to sit outside under the trees with a coffee and a glass of wine and watch the market trading and the ebb and flow of the passers-by. 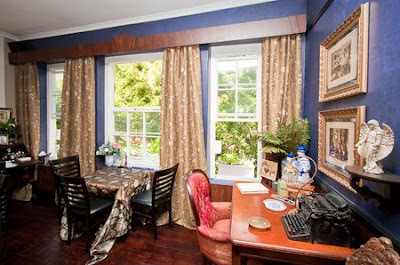 The Café boasts a wi-fi connection, so bring your laptop and sit upstairs and work in peace, perhaps with a glass of wine at your elbow. Some enjoy agonising over a crossword puzzle for hours with a cuppa to sustain them. The tranquility of the living room and the comfy sofa upstairs will allow them to do just that.